Many like the addition of flowers to the exterior of their homes and playhouse. 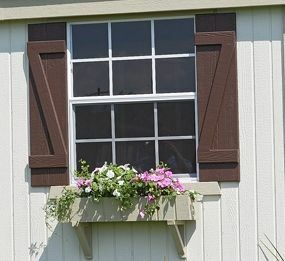 Little Cottage Company provides a great way to add flowers to the front and sides of your playhouse with the Additional Playhouse Flower Box kit. This kit is easy-to-install and a great way to increase the visual appeal and enjoyment of your LCC structure! Let imagination bloom and play by adding the flower box kit to your playhouse today!